Sometimes the brightest insights come to you during a walk: the rhythmic, quiet movement in nature relaxes the firmness of your convictions, creating an opportunity for a new vision on the subject. Tenacious frames of mind about your preferred career, or the unattainability of it, suddenly seem to be changeable or dismissible after all. That is a relief and it offers clarity about your situation. The structure of the labyrinth is meant to enable letting go of the old and receiving the new. 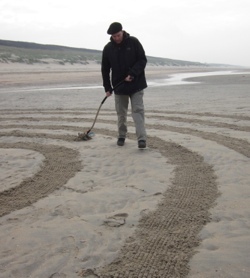 I “draw” with my rake the labyrinth pattern on a beach, or another quiet, sandy location, in line with your preferences for that moment with regard to orientation and size. Then it is all yours to enter and walk. Earlier, for instance in a beach tent, we discussed your questions and wishes for the walk and how to make it as effective as possible. During your walk, I remain outside the labyrinth and make pictures of your journey, so you can more easily remember what happened when, while walking. When you have ended your walk and are ready, we stay or return to the beach tent to talk about what has happened and conclude the session. Usually, a labyrinth session takes about three hours. Afterwards I send you a CD with a selection of the photographs that I have made. In the Labyrinths menu you can read more about the labyrinth, its form and meaning, and have a look at various pictures of earlier labyrinth walks.